Our I.P.A. 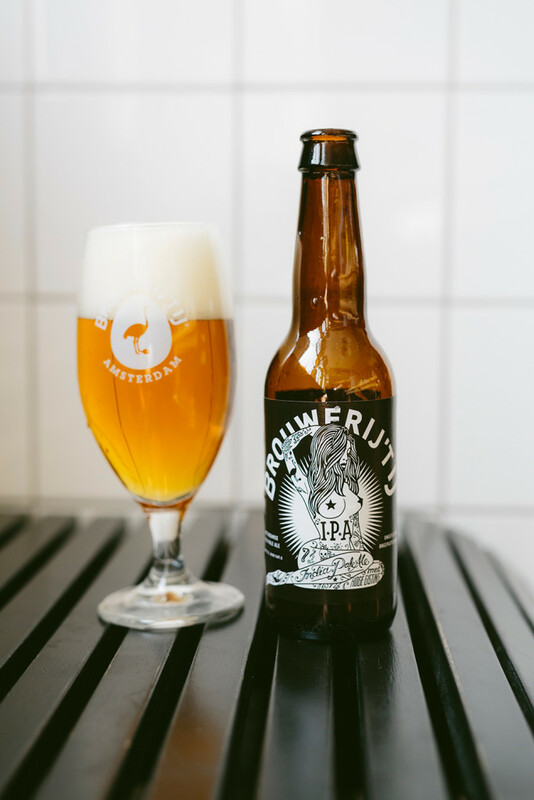 is a dark-blonde beer with an emphatic, hoppy flavour. I.P.A. stands for India Pale Ale, a British type of brew in which the alcohol percentage and hop recipe were boosted so that the beer would survive the long sea voyage to the colonies. This recipe turned out to be a real winner and quickly became popular. In our I.P.A., we add hops to the beer during the maturing process as well as the brewing to produce delicious aromas of grapefruit and flowers. A beer with a fruity, bitter aftertaste that lingers for a long time. Fantastisches Bier, der fruchtige Geschmack ist sehr exotisch, bis hin zu einer Andeutung von Ingwer. Bitter auf der Zunge rund im Abgang. Da kann sich jeder Craftbrewer verstecken! I love the balanced flavour and long, fruity finish of this IPA. 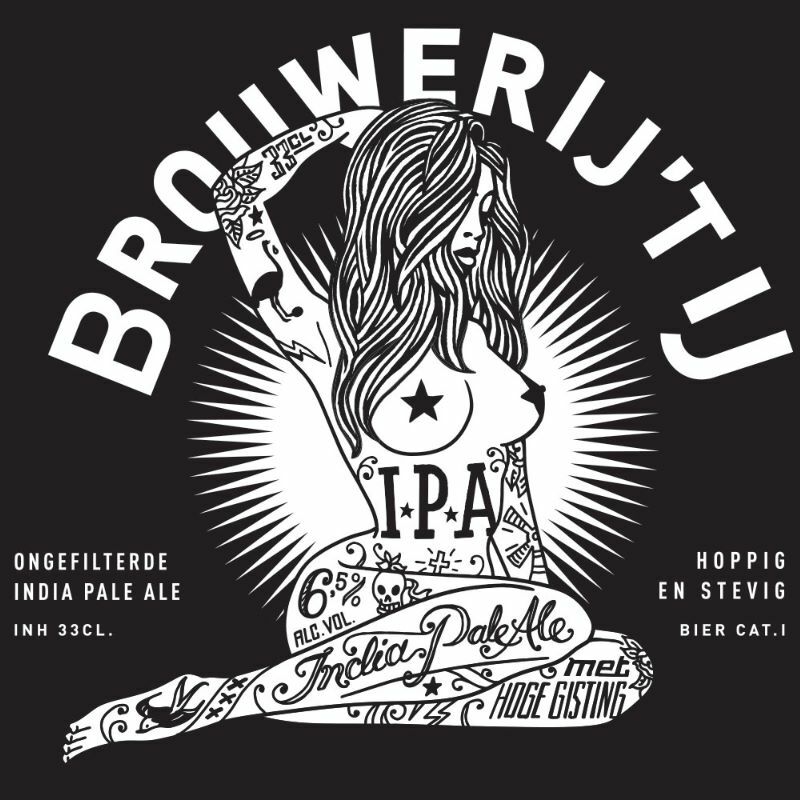 I also like the label design and fact the tattoos can be read to give details about the beer. I’m keeping my eyes open for it in England. One of my top favorite IPAs by a long shot. Ah.may.zing. Just sayin’! I was in the Netherlands on business in March and tried the IPA. Loved it!! I’m not an IPA fan as a rule, but this one struck just the right note. Oh, kind of like the label too. Will be looking for it here (Seattle area, USA) but if I have to order it, I’ll do that too. Where would I be able to buy this beer from? Depends on where you are Jason. Where are you? Do you sell it in London? Genial, voll lekker, sehr aromatisch, vielfältiger Abgang, mehr davon ! I was in Amsterdam in April. Absolutely fell in love with every beer at this place! Nothing else is the States compares! Is there a way to get this shipped state-side? I’m planning a trip back here soon, but I can’t live without it in the meantime! We are planning to brew more beer in the future but for now it is still mostly a local affair. Glad you liked all of them. Hang in there! I just got back from Amsterdam, and I had this beer. Its one of the best I’ve. I’m from San Jose, CA where can I find this beer? We don’t ship so we don’t know Glenn… Good luck with the hunt! This beer was life-changing. Have been searching for it everywhere in the states. Any luck for Texas or Louisiana (New Orleans)??? Any recommendation for a beer in the US that would taste like your IPA? Need something to hold me over until you guys can ship international! Wouldn’t know, nothing compares Greg! Come back soon?